The Friends of Baker Prairie has launched a campaign in order to provide picnic tables for the new pavilion that will be constructed later in the year. If you or your group is interested in participating in this campaign, a full picnic table — with an honorary plaque — will be $750. Please contact Cheryl Satterfield at satterfield.harrison@live.com for more information. This entry was posted in Uncategorized on June 25, 2017 by searchforsimple. The Friends of Baker Prairie is pleased to announce that, with help from a grant from the Arkansas Game and Fish Commission, a pavilion will be constructed on Baker Prairie. Situated on the knoll above the middle school’s water retention pond, the pavilion will be 40×20 feet, rectangular in shape, and will command a wonderful view of the prairie as well as providing a great jumping-off point for birdwatching, wildflower hikes and other prairie-related activities. Construction will take place in the late summer or fall and will hopefully enhance the prairie’s accessibility. The Friends of Baker Prairie has just awarded its annual $250 scholarship to Olivia Eddings, who will be attending Hendrix College in the fall for Environmental Studies. Olivia is a graduate of Harrison High School. Congratulations! Terri Gregory got some great pictures of the Baker Prairie trip. Check them out! She also got a great picture of some of the slower-moving citizens of the prairie! This entry was posted in Uncategorized on June 4, 2017 by searchforsimple. June Walk on Baker Prairie a Wonderful, Birdy Jaunt! The June Baker Prairie walk, co-sponsored by the Friends of Baker Prairie and the Disorganized Bird Club, had a total of 16 people participating in this bird walk and clean-up to explore and enjoy one of our town’s most precious natural areas. The weather was surprisingly mild as we headed off and although the overall bird count for the day was a bit on the short side, we did get our three target species that the prairie in known for: the willow flycatcher, the Bell’s vireo, and the painted bunting. Present for the birdwatching for DOBC members Gina Booth, Jack and Pam Stewart, Terri and Alan Gregory, Linda Mann, Dianne Beard, Cheryl Satterfield, Joan Lipsmeyer and Sheree Rogers as well as me and Tim. We were later joined by Bob Hotchkiss and Margaret Lonadier, both board members of the Friends of Baker Prairie and by Jennifer Ogles of the Arkansas Natural Heritage Commission to help pick up a little trash and to pull out invasive Queen Anne’s Lace from the prairie itself. It was a great morning on the prairie. Stay tuned for upcoming pictures and for more information about prairie events! This entry was posted in Uncategorized on June 3, 2017 by searchforsimple. Two beautiful plants flowering on Baker Prairie right now are Indian paintbrush (Castilleja coccinea) and Ozark trillium (Trillium ozarkanum formerly Trillium pusillum var. ozarkana). Indian paintbrush can be seen from the road on the western side of the prairie to the south of the sign, but to really see its true beauty and the color variations such as yellow and peach, take a walk along the path. The red-colored parts are not part of the flower, but bracts underneath the tiny flowers. Although Indian paintbrush is often a prairie plant, it can also be seen growing upon bluffs by the Buffalo National River. When you’re walking along the path to see the Indian paintbrush, follow the path to the right and you will find Ozark trillium aka Ozark wakerobin. Look for it in the trail as you’re heading down a slope. When you find it on the trail, step off to the west (left), and you can find larger clumps of it partially hidden by dried grasses. The flowers are white when they are young, then turn pink and purple as they age. The Ozark trillium is also found in other areas of northwest Arkansas, usually near small streams, and in a few places in the Ouachitas. This entry was posted in Uncategorized on April 10, 2017 by searchforsimple. Welcome to the New Baker Prairie Website! 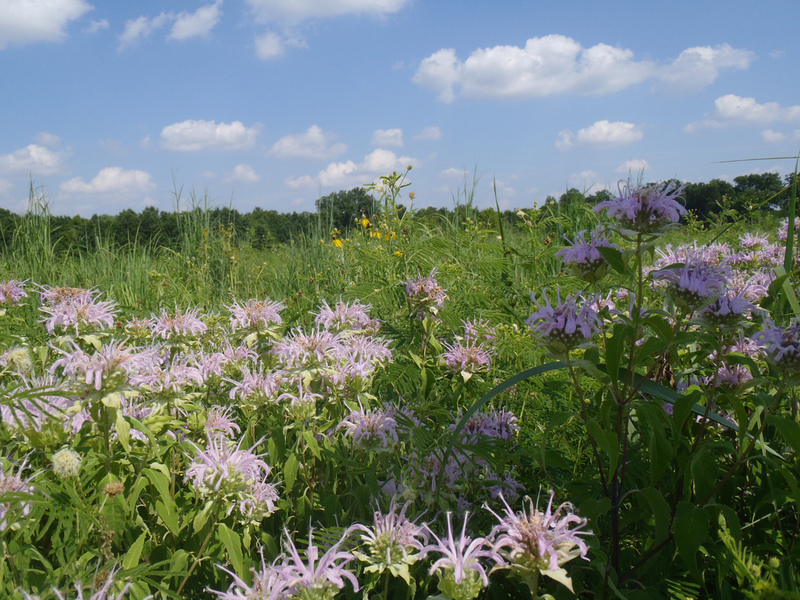 We would like to welcome you to the new website for Friends of Baker Prairie. If you are following this site, a message will appear in your inbox whenever a we make a post. In order to do this, please click on the “Follow” button on the site. We will use this site for photos of the prairie, announcements of upcoming events, and general observations. Please feel free to email me at timonandstephanie@gmail.com to submit pictures, comments, etc. !